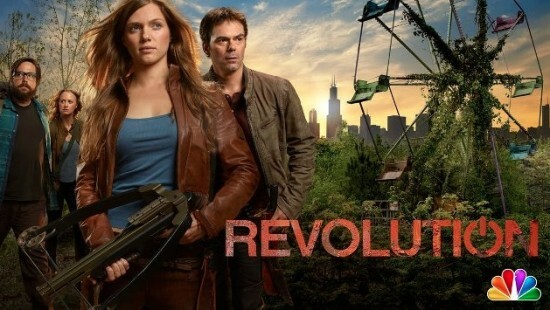 The J.J. Abrams/Eric Kripke collaboration Revolution had its debut this past Monday and it scored a big win in the ratings. The episode pulled a 4.1 rating in the 18-49 demographic and 11.65 million total viewers, which counts as a victory for NBC on every front and it’s the highest debut for a genre series since V in 2009 (which had a 5.0 rating and almost fourteen million total viewers). However–and you knew there had to be a however–let’s not go trumpeting this one as the next major genre hit just yet. First off, it had some name brand recognition going in with Abrams and Kripke attached, so many people tuned in for their involvement alone. The show also had no competition from new episodes on the other broadcast networks this week either (that changes next week). And then there’s the trend that we have seen quite often with shows of this very nature over the last few years. Revolution is looking to deliver a heavily arc-driving story with plenty of mysteries to string viewers along very much in the vein of Lost (which Abrams co-created). And we have seen several examples of late of shows following this very template that start out strong, but then head into a quick death-spiral. FlashForward, V, and The Event all did this, so we can’t put too much stock in the strong debut of Revolution just yet. We need to give it a couple of months to see if the numbers hold up, at least within respectable ranges. If, like ABC’s genre hit from last year Once Upon A Time, Revolution can stay above a 3.0 rating, it should be safe. And considering that it is on fourth place NBC, perhaps even staying above a 2.5 will keep it alive. But if it slips below that, then it may very well follow the same path as the other Lost-wannabes that flamed-out too quickly. The successful debut for the show proves that there is a large audience for this type of show, but the also have high expectations. FlashForward, V, and The Event all had their quality issues which lead to a quick decline in their viewership. So if Abrams and Kripke have not established a tight, engaging story arc for their series, it may suffer the same fate. Keep an eye on the numbers, but for now consider the show to be in good standing. Not receiving good news on Monday were Syfy’s two Summer shows which are now in the stretch run for their current seasons. Both Alphas and Warehouse 13 dropped to a 0.4 rating in the 18-49 demo and both had about 1.3 million viewers. The shows have been struggling to maintain an audience since they returned last July, especially in the all-important 18-49 demo, and seem to be losing the battle. The numbers aren’t terrible for the current season, but they have dropped considerably from the prior year when Alphas averaged around a 0.7 rating and Warehouse 13 was closer to a 0.8. I’ve been holding off on raising the Cancellation Alert status on the shows, but after seeing these numbers I have to bump them up one notch to Moderate. Syfy may still have patience with them because Warehouse 13 is one the network’s flagship shows and Alphas has become somewhat of a cult hit, but don’t be surprised if they decide to throw one or both to the curb. And unfortunately, Alphas is the most vulnerable as it will only have two seasons totaling 26 episodes completed which puts it far away from enough episodes to interest the syndication market. Another stinker in the ratings among genre shows was last Friday’s “bonus” episode of Touch. FOX decided to slot in a new episode of the series last Friday for reasons beyond me, and not surprisingly it completely tanked. The episode pulled only a 0.7 rating and 3.1 million total viewers, not good for one of the Big Four broadcast networks. I don’t know if they were just trying to get a taste of how the show would perform once it has its planned debut in that timeslot in October, or if they just had an hour to fill and decided to burn off one episode of Touch there. But this show is already on unsure footing coming into the season, and its Friday numbers don’t help it at all. The guys over at TV by the Numbers think that Touch might move into the Monday 9 PM EST timeslot since new series Mob Doctor had a poor debut this week and likely won’t last long. Perhaps that’s true, but I don’t know that Touch is going to do much better considering the downward trend it saw all last season and its poor outing this last Friday. Keep a close eye on the numbers, but I advise against getting too attached to this show. Lastly, I’m not certain what NBC is doing with Grimm. The August debut for the series in the Monday night timeslot didn’t set off any ratings fireworks, then they yanked it from its final planned Monday airing (on Sept 10th) and its scheduled return to its regular Friday timeslot is delivering repeats with no new episodes scheduled until Sept 28th. I guess they’re giving those who missed the August eps a chance to catch up, but this might be confusing for those who did tune in last month. Basically, it looks like they should have just waited for the regular season to kick of the show’s sophomore year. We will see the impact this had when we get the numbers for the first new Fall episode which hits next Friday.